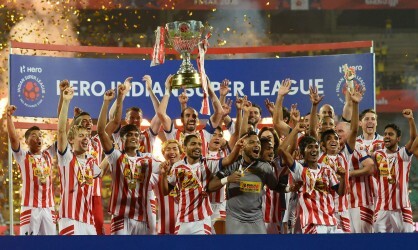 The Hero Indian Super League 2017 witnessed a sharp spike of over 103% in domestic players’ salary as compared to the inaugural year of ISL in 2014, as the ten clubs together spend INR 48.85 crore today to secure signatures of 156 players at the end of the day long ISL Indian Player Draft here in Mumbai. The ISL 2014 Player Draft, the first ever player draft held ever in India, had recorded INR 24 Crore spend by eight ISL clubs. Anas Edathodika and Eugeneson Lyngdoh, each pegged at INR 1.10 crore were the flavours of the day, predictably being picked immediately at the opening of the draft. New entrant Jamshedpur FC didn’t waste a minute to announce Anas as their first ever player on their roster while ATK secured Eugeneson at the first given opportunity. 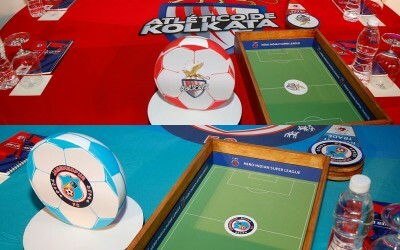 The fourth season of Hero Indian Super League – which will kick off on 17th November 2017, will feature 25 of the 29 Indian National Players including stars like Sunil Chhetri, Jeje, Eugeneson, Jackichand, Sandesh, Pritam, Subrata Paul and Jayesh donning colours of their respective teams over an extended 5 months League. 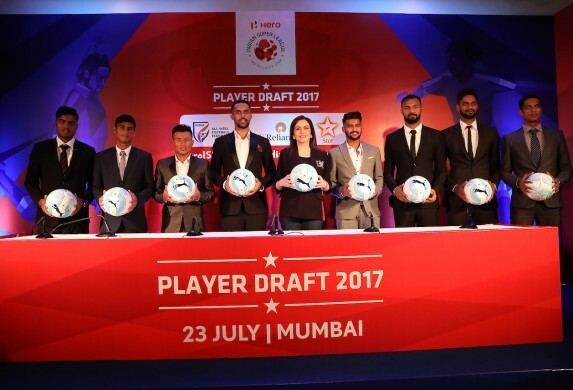 Coming into the Indian Player Draft, 10 ISL Clubs together had spent INR 11.51 Crore in retaining a total of 22 players ahead of the 7th July 2017 deadline. Today, the Clubs looked at completing the Indian Player quota of minimum 15 and maximum 18 players, including two U21 development players. By the end of the day, 134 best and most promising players got drafted across ISL clubs with a combined salary of INR 37.33 Crore. Including the spend on retained players, total spend by clubs was recorded at INR 48.85 Crore. The Indian Super League two-time finalist Kerala Blasters FC gave a big thumbs up to the emerging talents coming up through the ranks at college competitions, as the Sachin Tendulkar co-owned team picked up Ajith Sivan – a Nirmala College, Kochi student who was scouted through the inaugural Reliance Foundation Youth Sports campus National football championship. At the end of the day, Bengaluru FC emerged as the most invested club on Indian players with a spend of INR 6.01 Crore on 17 players, followed by Kerala Blasters FC spending INR 5.93 crore of their purse over 16 Indian players. With Indian Players coming onboard, the ISL clubs will now look at forming the combinations with foreign players signings. Each club is allowed to sign minimum 7 and max 8 international players for the season. Debjit Majumdar (Retained), Prabir Das (Retained), Eugeneson Lyngdoh, Jayesh Rane, Keegan Pereira, Shankar Sampingiraj, Anwar Ali, Hitesh Sharma (U21), Robin Singh, Rupert Nongrum (U21), Ashutosh Mehta, Augustin Fernandes, Ronald Singh (U21), Kunzang Bhutia and Bipin Singh. Sunil Chhetri (Retained), Udanta Singh (Retained), Nishu Kumar (Retained- U21), Malsawmzuala (Retained- U21), Lalthuammawia Ralte, Rahul Bheke, Harmanjot Khabra, Subhashish Bose, Alwyn George, Lenny Rodrigues, Zohmingliana Ralte, Thongkhosiem Haokip, Abhra Mondal, Boithang Haokip, Collin Abranches, Joyner Lourenco and Calvin Abhishek. Jeje Lalpekhlua (Retained), Karanjit Singh (Retained), Jerry Lalrinzuala (Retained- U21), Anirudh Thap (Retained- U21), Thoi Singh, Bikramjit Singh, Dhanachandra Singh, Germanpreet Singh, Fulganco Cardozo, Pawan Kumar, Keenan Almeida, Mohammed Rafi , Ganesh Dhanpal , Sanjay Balmuchu, Francis Fernandes and Shahin Lal Meloli. Pritam Kotal, Lallianzuala Chhangte (U21), Lalhmangaihsanga - Sena Ralte, Albino Gomes, Seityasen Singh, Pratik Chowdhury, Vinit Rai (U21), Romeo Fernandes, David Ngaihte, Sukhadev Patil (U21), Sajid Dhot, Rowilson Rodrigues, Munmun Lugun, Arnab Das Sharma and Simranjeet Singh. Laxmikant Kattimani (Retained), Mandar Rao Dessai (Retained), Narayan Das, Pronoy Halder, Chinglensana Singh (U21), Brandon Fernandes, Seriton Fernandes, Pratesh Shirodkar, Naveen Kumar, Mohamed Ali, Jovel Martins, Amey Ranawade (U21), Anthony Dsouza, Mohammad Yasir (U21) and Bruno Colaco. CK Vineeth(Retained), Sandesh Jhingan (Retained), Prashanth Karuthadathkuni (Retained – U21), Rino Anto, Lalruatthara, Milan Singh, Arata Izumi, Subhasish Roy Chowdhury, Jackichand Singh, Siam Hanghal, Lalthakima (U21), Pritam Kumar Singh, Samuel Shadap, Loken Meitei (U21), Karan Sawhney and Ajith Sivan (U21). Amrinder Singh (Retained), Sehnaj Singh (Retained), Rakesh Oram (Reatines – U21), Balwant Singh, Arindam Bhattacharya, Raju Gaikwad, Abhinash Ruidas, Sahil Tavora, Aiborlang Khongjee, Sanju Pradhan, Zakeer Mundampara, Biswajit Saha, Pranjal Bhumij (U21), Mehrajuddin Wadoo, Kunal Sawant and Lalchhawnkima – Kimkima. Rowllin Borges (Retained), TP Rehenesh (Retained), Holi Charan Narzary, Nirmal Chettri, Lalrindika Ralte, Robert Lalthlamuana, Seminlen Doungel, Reagan Singh, Ravi Kumar, Gursimrat Gil (U21), Malennmgamba Meitai, Abdul Hakku, Fanai Lalrempuia, Gurpreet Singh and Sushil Meitei (U21). Anas Edathodika, Subrata Paul, Mehtab Hossain, Souvik Chakraborty, Robin Gurung, Bikash Jairu, Mawihmingthanga –Jerry (U21), Shouvik Ghosh, Sairuat Kima (U21), Sanjiban Ghosh, Farukh Choudhary, Sumeet Passi, Yumnam Raju, Ashim Biswas and Siddharth Singh. Are foreign club tie-ups in India just a Sham?